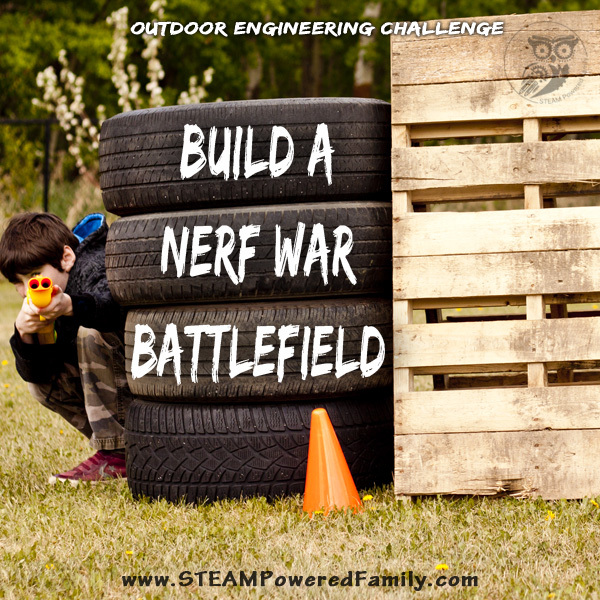 Build a Nerf War Battlefield in your own backyard, it’s not as hard as you think and it is a great upcycle and engineering challenge for kids. Not to mention the hours of play that will follow once it’s constructed. When my son announced that he wanted to have a Nerf gun war party for his birthday I immediately started researching places that host these types of parties. In the past I always tried to host birthday parties at a facility where they have staff that do all the work. I quickly pulled up all the local offerings, then I started freaking out. The cheapest party package I could find was $300 and they only got an hour of playtime, but it went up from there to $1000 for a two hour party! Who pays $1000 for a two hour kids party? That is total insanity. We live on the outskirts of town and are lucky to have quite a large backyard, but unless you have a postage stamp yard, these Nerf War Battlefield obstacles could be built in many backyards or open spaces. And the best part is that our Nerf War Battlefield uses materials that were heading for the dump or recycling anyway, so it’s a fantastic way to upcycle and build something amazing for next to nothing in cost! To start you need some wood palettes. These can be found in lots of industrial areas. Check your local Kijiji or Craig’s List or Facebook Buy/Sell type groups and I’m sure you will find someone getting rid of these. You might even find them at a local eco-station. Next you need some tires. Again you can ask around, check local buy/sell or your local eco-station. Our local eco-station always has hundreds of tires waiting to be recycled. Finally some long screws, which you may already have in your garage. While building these I recommend you wear gloves. The palettes tend to have splinters and the tires dirty. Give everything a good wash and take a palm sander to the palettes if they are particularly rough. Now start building your Nerf War Battlefield! Start simple, stack some tires. We spent some time determining how many tires tall our obstacles should be. It was interesting watching the kids test and evaluate until they determined that 3 tires high was a good height for them. 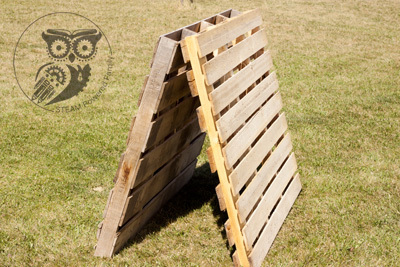 Next, with the help of Dad, they decided to attach two palettes at the top with a long screw to create a pyramid. These can be placed point up, so you can crawl underneath, or place the palettes on their side to create a barrier you can hide behind. The cool thing with this side arrow type placement is that you can pop a board off and create a slot for firing through. The boys wanted to do a storm the castle type game, so they also created a special barrier that included two palettes, a stack of tires, and a tire on the top on it’s side. In that top tire they would hide a prize that the teams had to try and capture. When the boys were happy with the course they had built it was time to organize the Nerf guns! The easiest way to run a Nerf War battle is to have everyone bring their own guns, but ask that they only bring guns that use the standard bullets. That way while they are playing they can simply scoop up more ammunition and keep going. We found it easiest to provide all the bullets. That way no one had to worry about losing their bullets. Then at the end of the day we gathered up all the bullets in a bucket, ready for next time. We also grabbed a batch of old Nerf guns that someone was selling locally so we had lots of extra guns on hand. In the end the only cost for building our Nerf Gun Battlefield was the bullets (which we bought new), and the second hand guns. Not only was it a fraction of what the facilities were charging but now we can have Nerf battles all summer long and my boys continue to go out and engineer new barriers and obstacles. 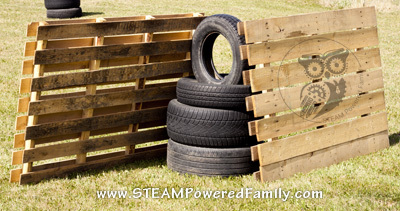 They have also discovered that they can double duty the palettes and tires into Ninja Warrior type obstacles. You can see the course in action in this awesome first person video my son created. Learn more about how he did this here. 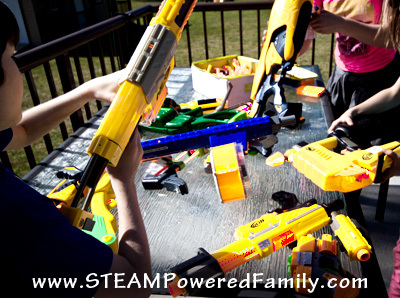 It is going to be a fantastic and fun summer in our backyard with our Nerf War Battlefield this year! Want to see what we did next??? 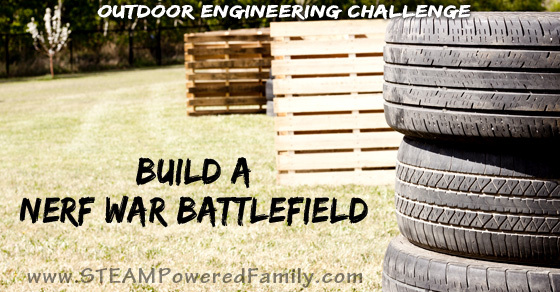 Check out this post featuring an Outdoor Nerf War Tech Challenge – Video game inspired. Where kids create their very own Nerf War Videos! 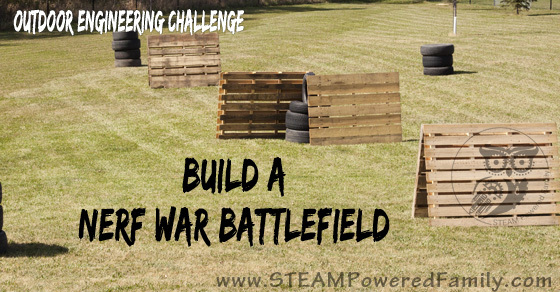 This looks like a fun battlefield for boys! My kids would sure love to make this. Since we recycle pallets for a living they have access to them all the time. We don’t have spare tires, but I think we could use the barrels we have? What a great idea! My boys love Nerf Guns and we have tons of pallets hanging around my husband’s work. PInned! So glad you enjoyed it! Have a great Nerf summer! How super cool is this?!?!?!?! My boys are small but I’m sure we’ll be building this some day! Thanks for sharing at #HappinessIsHomemade and congrats on the feature this week! This is a life saver! Thank you!! My son turns 8 this Spring & has asked for a Nerf party. I’m so excited to get started!! Excellent! Have a great time making amazing memories! Oh my goodness. I can’t wait to show this to my husband so we can get building. The kids will love it!